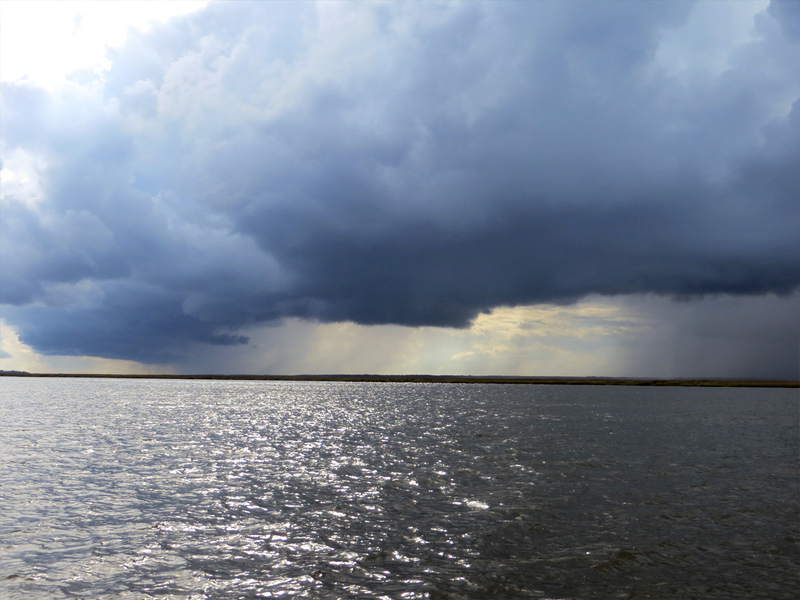 After three enjoyable weeks of delightful fall weather, a stationary front has brought cloudy skies and persistent rainfall to Charleston on the morning of our departure. It is tempting to ignore the shrieking 6 AM alarm. How sublime it would be to enjoy another hour of sleep and while away a few more mornings sipping coffee at Caviar and Bananas. The primary mission of the snowbird, however, is to continue the journey south, rain or shine. It is 0700, the tide is slack and duty calls. Cutter Loose is underway from the Charleston Maritime Center towards the Wappoo Bridge where the first opening of the day is scheduled for 0900. An early arrival places us at the front of the queue for the procession south. Given the rain and poor visibility, only three vessels arrive for the 9 AM opening. This bodes well for light traffic on the ICW today. 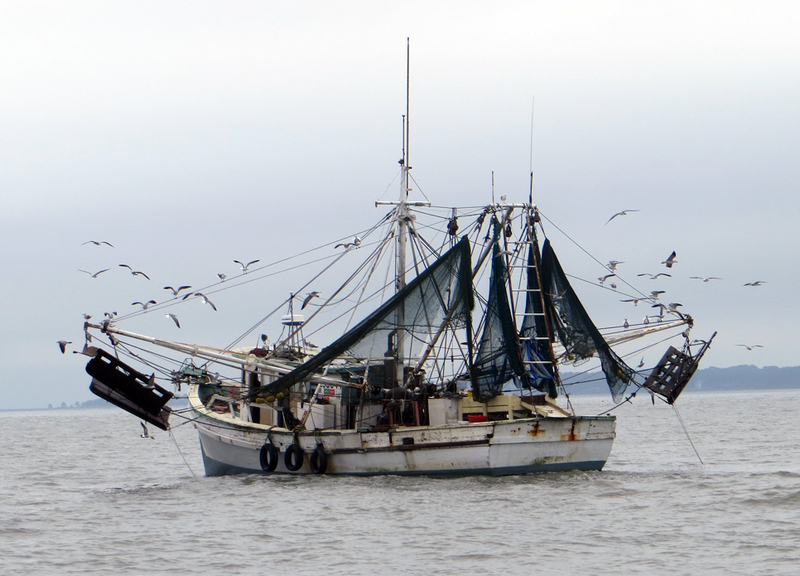 Our course takes us on a circuitous route through the rivers, creeks and tidal marshes of the low country. Elliott Cut connects the Wappoo Bridge with the Stono River. 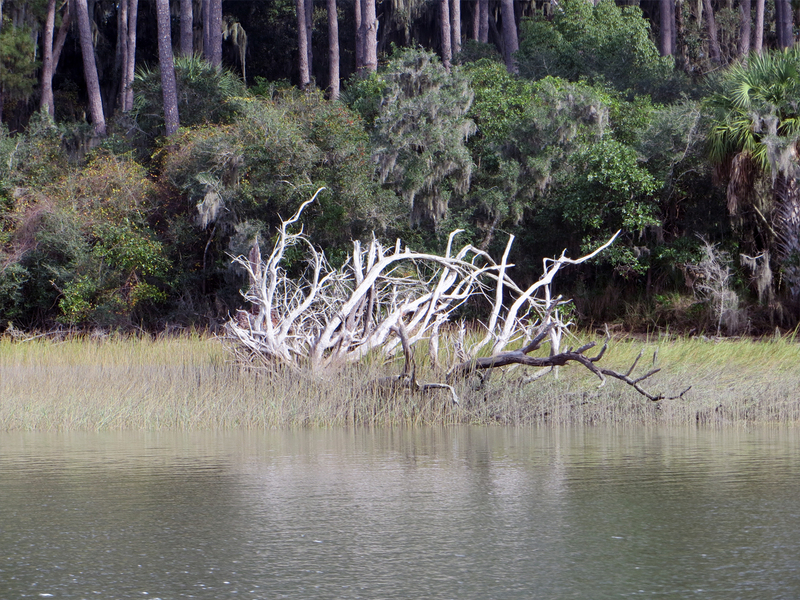 The Stono flows into the Wadmalaw River which flows into the North Edisto River. 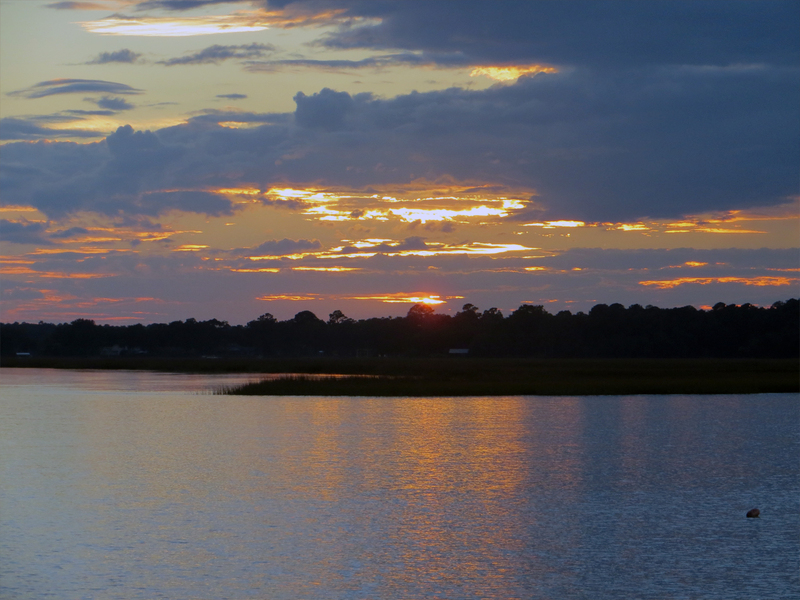 At Edisto Island, the ICW follows the Dawho River through Watts Cut to the South Edisto River. By 2 PM, the rain dissipates thereby improving visibility. But heavy cloud cover continues to blanket the South Carolina coast for the remainder of the day. Once through Fenwick Cut, it is less than a mile to Rock Creek where the anchor is down at 3:20 PM amidst shorebirds combing the marsh grasses. 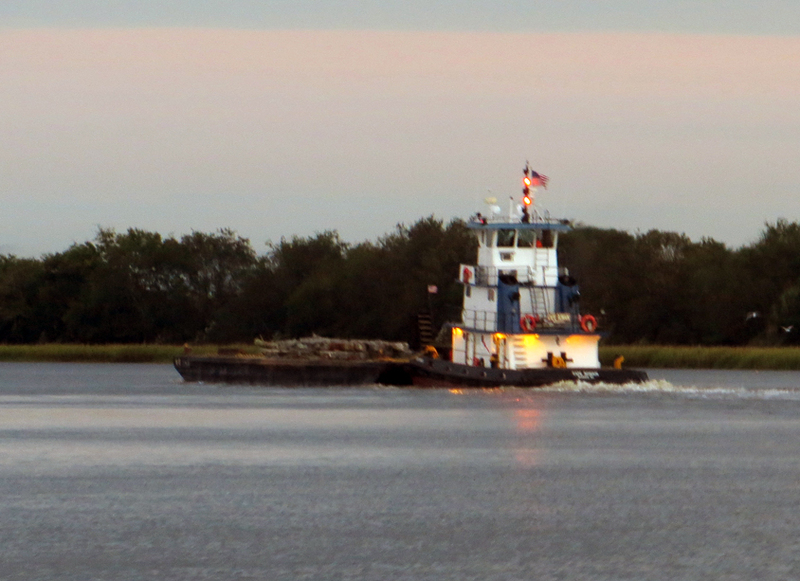 This vantage point affords an excellent view of late afternoon tugboat and barge traffic along the waterway. Today’s journey is a vivid reminder of the engineering marvel of the ICW. Its designers succeeded in interconnecting a maze of tidal rivers and creeks with dredged land cuts to create a navigable inland passage that extends from Norfolk to Miami. A bird’s eye view of the Atlantic coast reveals hundreds of rivers, creeks and streams carved into the tidal marshland that give the appearance of veins and arteries in the human circulatory system. Both aesthetically and functionally, the ICW is a national treasure and a gift to all who ply these waters. Predicting tidal current along the ICW is quite a challenge. Introducing dredged land cuts to the maze of tidal rivers and creeks interrupts nature’s method of flooding and discharging seawater from the coastal drainage basin. Tidal currents often change direction when transiting from a tidal tributary to a land cut and vice versa. Oftentimes, transiting a shallow area of the ICW at high tide is more a matter of good fortune than thoughtful preparation. Overnight showers have ended when the time comes to raise the anchor near low tide at 0700 on Wednesday. Today, the sun will remain elusive…concealed under heavy cloud cover as Cutter Loose presses further south along the South Carolina coast. 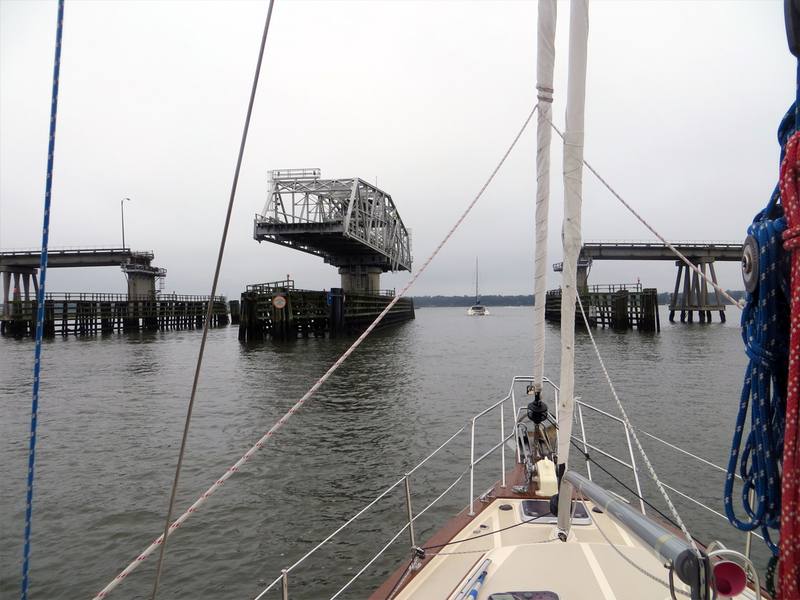 Our course takes us through the Ladies Island Swing Bridge past the quaint village of Beaufort, SC and into Port Royal Sound, a deep water inlet to the Atlantic Ocean. Under normal circumstances, the snowbird voyager would follow the Port Royal Channel southeast into the Atlantic for an overnight sail to Fernandina on the Florida/Georgia border. 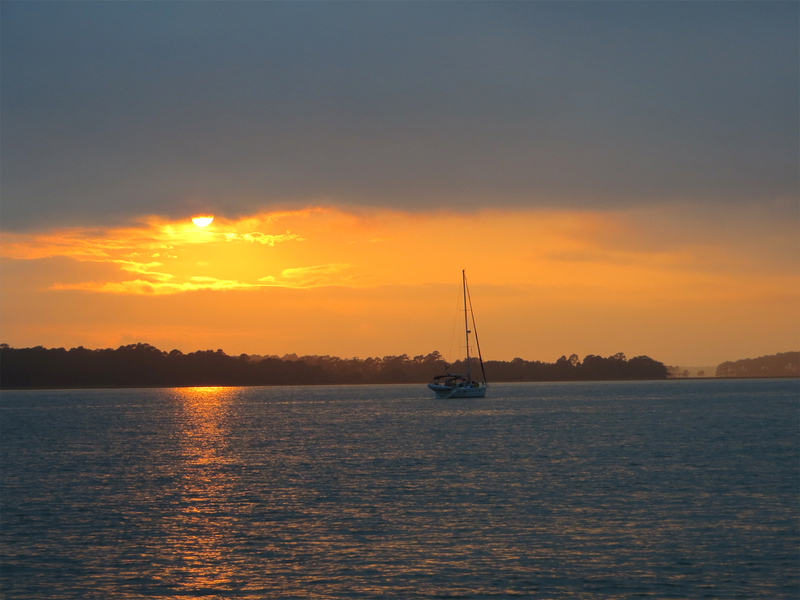 Instead, we opt to call at Hilton Head Island, just 20 miles south of Beaufort on the ICW. At 1:40 PM, the anchor is down in the May River which rewards us with a stunning sunset view of the mainland. 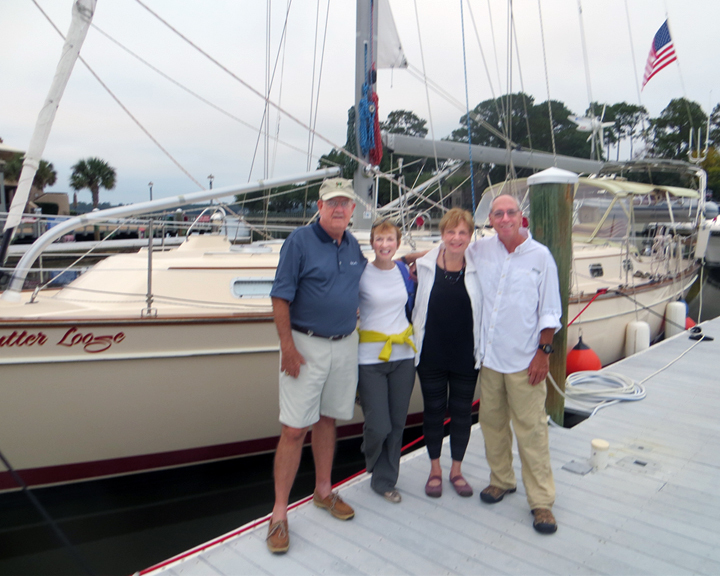 On Thursday, the anchor is up at 0800 for the short run to Broad Creek where we have reserved a slip for two nights at Shelter Cove Marina. Although pricey at $2.50 per foot, many grocery stores, shops and restaurants are within easy walking distance from the marina. With little advance warning, Pittsburgh friends and former neighbors, Gere and Linda generously agree to meet for dinner. After a brief introduction to Cutter Loose, Gere and Linda provide a driving tour of nearby Long Cove Plantation and a visit to their beautiful golf course home. We are grateful for their hospitality and their willingness to meet on such short notice. 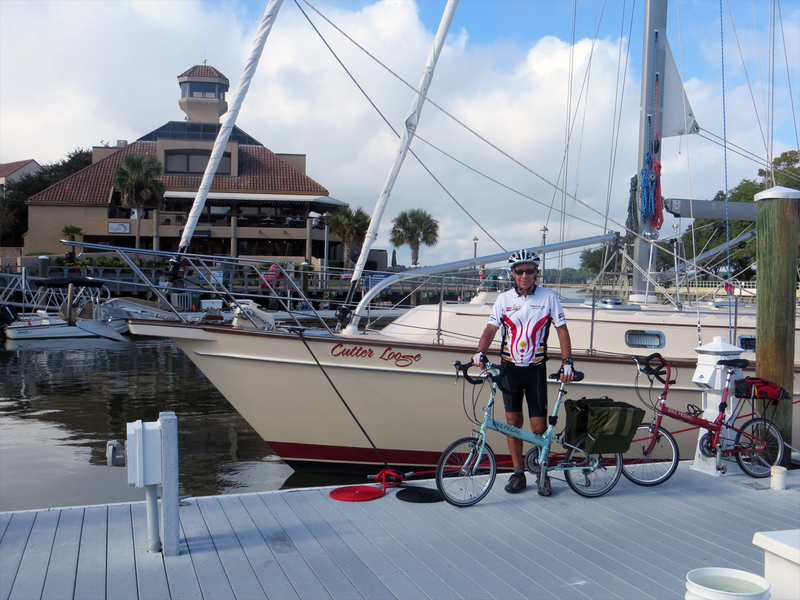 Friday is devoted to exploring Hilton Head Island’s 60-mile network of paved bicycle trails. The Bike Fridays are assembled and ready to roll at 0900. 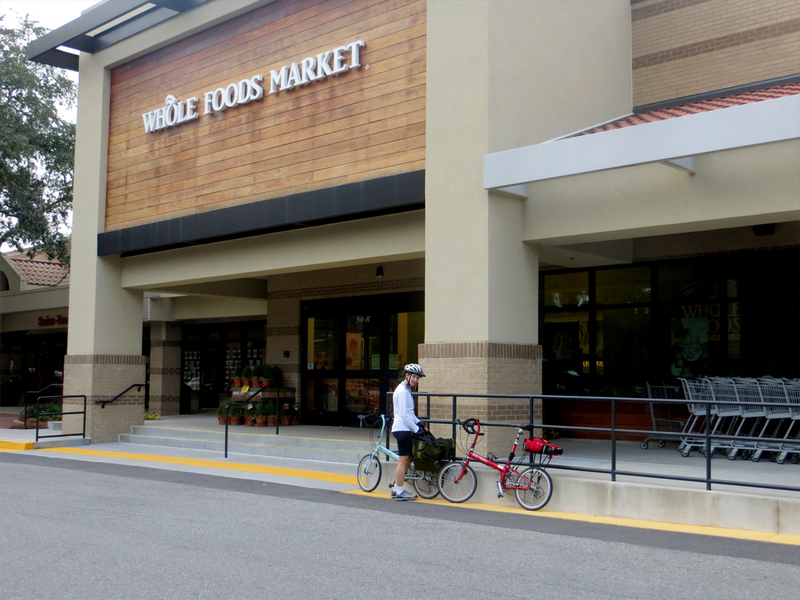 With the exception of stops for breakfast and grocery shopping at Whole Foods, our ride continues until late afternoon. The weather cooperates for today’s ride, providing warm and partly sunny conditions until mid-afternoon when an eerie fog rolls in from the Ocean. 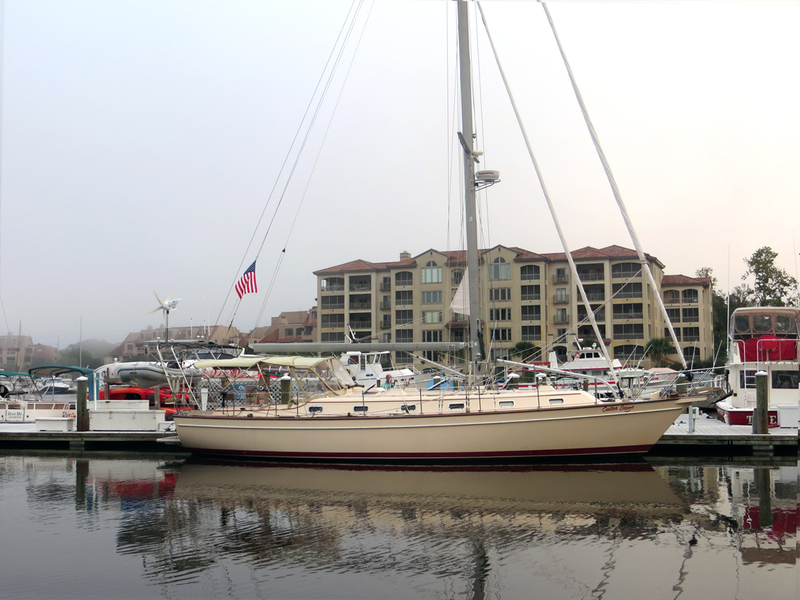 At daybreak on Saturday, our day of departure, the marina is ensconced in dense fog. This presents a dilemma since the tide is already falling and there is insufficient depth in the entrance channel to accommodate the five-foot draft of Cutter Loose at low tide. We are underway at 0730, inching our way through Shelter Cove’s channel with only an eighth of a mile of visibility. 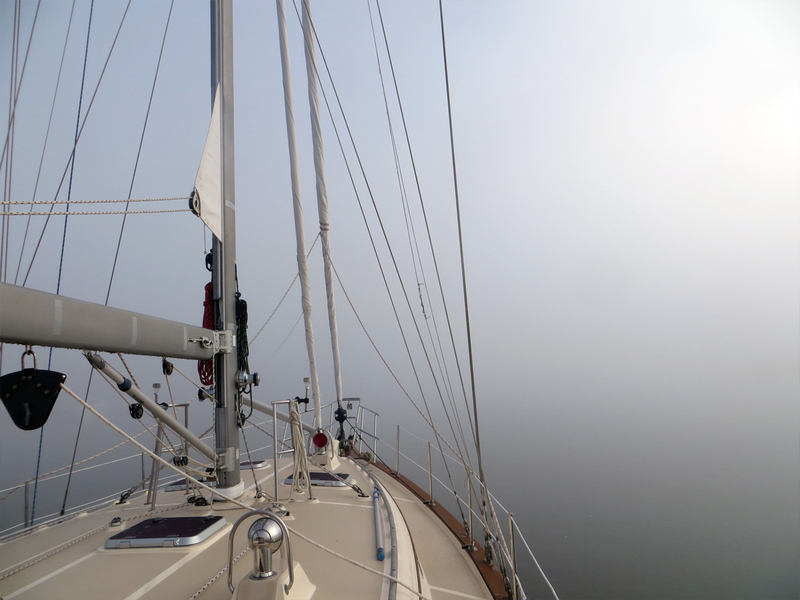 Once in the deeper water of Broad Creek, we drop the hook to enjoy a leisurely breakfast while the fog dissipates. As if on cue, a faint outline of the Cross Island Parkway fixed bridge appears on the western horizon at 0900 and Cutter Loose is underway for the second time this morning. Since a cold front is expected to pass through the SC/GA coastal waters after midnight, we are anxious to make southerly progress and secure a protected anchorage before sunset. By noon, Cutter Loose has crossed the Savannah River ship channel, leaving South Carolina astern and entering Georgia. Dramatic low cloud formations are moving rapidly in our direction from the northwest. Could this be the forecasted cold front staging an early arrival? Increasing cloud cover and the rise in temperature and humidity are ample warning that a change in the weather is imminent. 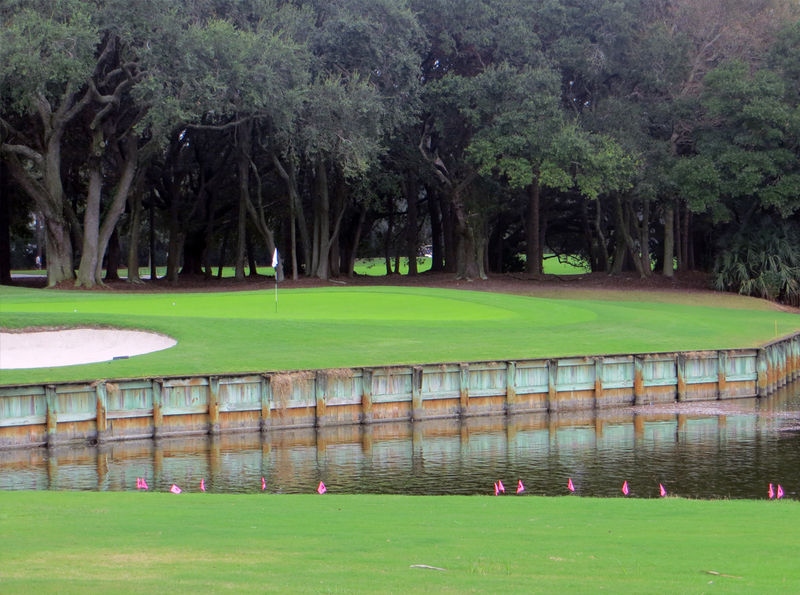 Once through the land cut at Hell Gate, our course takes us into the Ogeechee River. Here, there are several narrow tributaries that afford excellent protection should strong winds materialize overnight. With 66 nautical miles under the keel for the day, the anchor is down in Kilkenny Creek at 5 PM. By midnight, the wind has increased slightly and shifted to the north, signaling the passage of the front. At dawn, wind speeds in Kilkenny Creek have reached 20 knots. Heavy rain is forecasted to begin in the early afternoon. Given the absence of rain, the decision is reached to weigh anchor and press further south until the rain begins, at which time we will call it a day and drop the hook for the night. By mid-morning, the wind increases to 20 to 25 knots with gusts in the low 30s. To their credit, NOAA marine weather forecasters have nailed the wind speed predictions. On the waterway, northerly winds in excess of 20 knots are not necessarily a deterrent to southbound vessels. 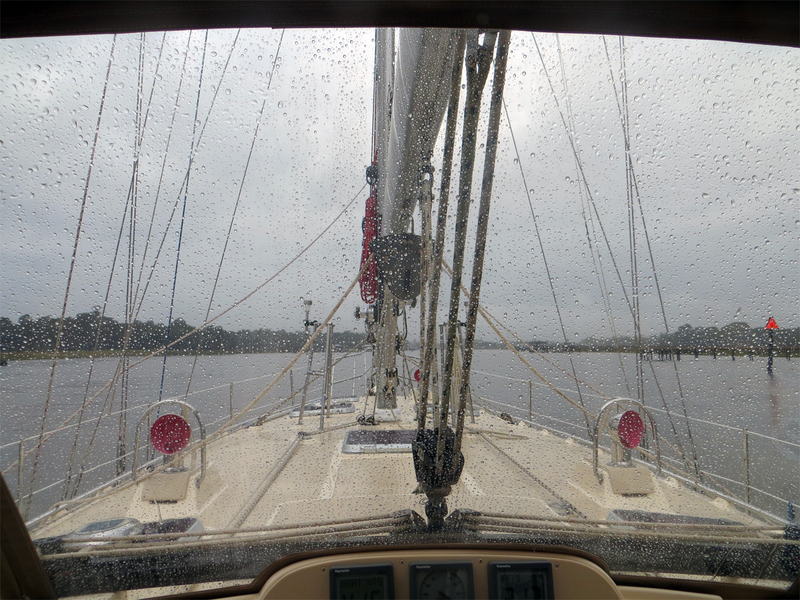 When the wind is astern, conditions on the ICW are normally quite benign. Since much of the Georgia waterway meanders through marshes, the wind does not have sufficient fetch over open water to create an uncomfortable chop. It is preferable to sail outside directly from Charleston, SC to Fernandina, FL, thereby avoiding shallow areas along the ICW. However, a favorable three-day weather window is a rare commodity at this time of year when cold fronts pass several times each week. One advantage of the more protected ICW route is that it is usually possible to make southerly progress every day regardless of weather. 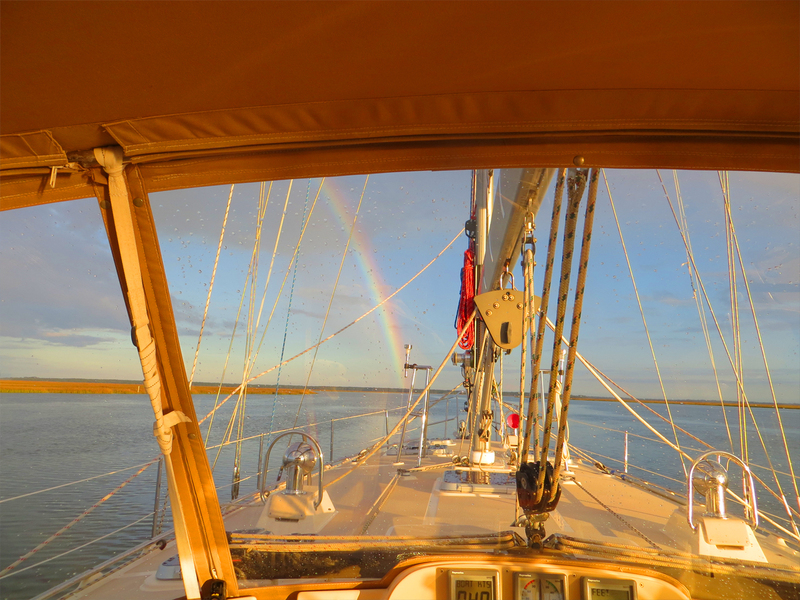 Our course today takes us through the Newport River and Johnson Creek into the broad waters of Sapelo Sound, an inlet to the Atlantic Ocean that is directly exposed to today’s northeast winds. Here, the seas are 4 to 5 feet with gale force winds howling at 30 to 35 knots with gusts to 40. This robust cold front is certainly packing a powerful punch. One can only imagine the sea state 30 miles offshore in these challenging conditions. With the wind astern and a favorable current, Cutter Loose makes rapid progress through this three-mile segment of open water. 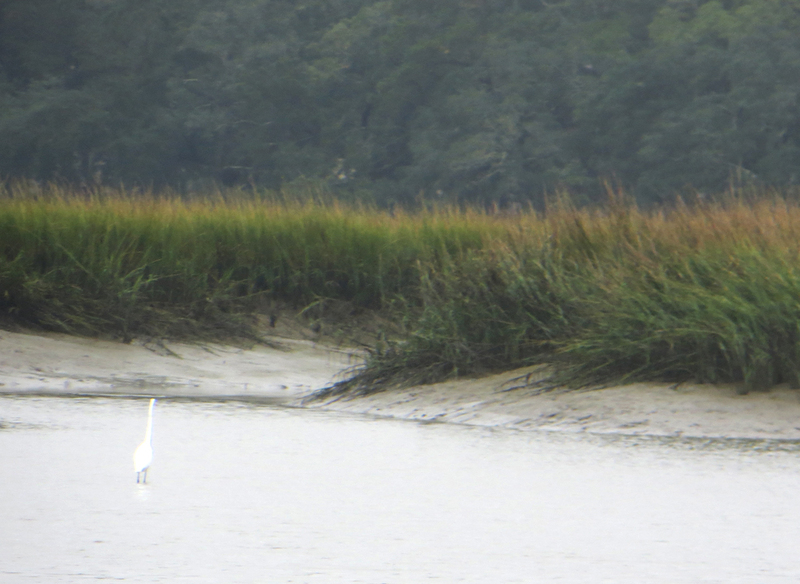 While navigating the ICW inland on the Sapelo River towards the relative protection of the Front River, a sailboat becomes visible in the shallow waters of Dog Hammock Spit, about one-half mile south of our course. It is conspicuous not only because it is the only other vessel we have seen all morning, but also because Dog Hammock Spit is such an unlikely place to see a vessel at any time, let alone during a strong cold front. Suddenly, the VHF radio comes alive with a distress call. It is the vessel we have been observing. The anxious skipper explains that his vessel is without propulsion. The engine is inoperable and the ship’s batteries have become discharged, weakening the boat’s VHF radio transmissions. The wind is blowing his vessel onto a lee shore. This poor chap is having a very bad day. We offer to be of assistance in relaying the captain’s request for emergency towing services to Sea Tow, a commercial towing service. Fortunately, the Sea Tow operator in nearby St. Catherine’s, GA responds immediately to our call on VHF 16. We pass along information provided by the vessel in distress, including the name and specific location of the vessel along with wind and sea conditions. With assurances from Sea Tow that it will immediately dispatch its tow boat to the scene, we resume our course and speed along the ICW towards the Front River. We were pleased to be an intermediary in this situation. But what would be the likely outcome of this scenario had Cutter Loose not been underway in this specific area of Sapelo Sound at this precise time? Wind driven rain begins to fall at 1 PM. At 1:30 PM, the anchor is down in the South River near Queen’s Island with 40 nautical miles under the keel for the day. In the lee of the nearby marsh, the water in the river is relatively calm. The gusty northeast winds, however, show no signs of abating. We are reconciled to a noisy, windy night here at Queen’s Island. On a positive note, the wind generator aboard Cutter Loose is enjoying these breezy conditions. Today, it is single handedly maintaining the house battery bank at peak charge, both day and night. At daybreak on Monday, winds in our protected corner of South River have subsided to 10 knots. Heavy rain showers and thunderstorms persist throughout the morning and into the early afternoon, delaying our departure from Queens Island. The front has become stationary just south of here and the center of low pressure is moving ever-so-slowly offshore. The result is persistent warm, humid, cloudy and rainy conditions. Finally, after 24 hours of steady rain, there is a break in the weather on Monday afternoon. Cutter Loose is underway from Queens Island at 1 PM for the short, 25-nautical mile run to Brunswick, GA. Our course today takes us through Altamaha Sound, Buttermilk Sound and the Mackay River en route to the Frederica River where the anchor is down at 4:30 PM near St. Simon Island. Under sunny skies, Cutter Loose eases into her slip at nearby Brunswick Landing Marina at noon on Tuesday. Our primary purpose for visiting Brunswick is to evaluate this facility as a potential layup site for Cutter Loose during the 2016 hurricane season. The marina was formerly utilized by the U.S. Navy as a hurricane hole to store the Atlantic fleet in the event of severe storms. Today, it is a popular place for cruisers to dock their boats during the summer months. With a total of 314 slips, the facility is huge. Nearly all of the slips are occupied. The business district of Brunswick is within easy walking distance from the marina. With parks, public plazas, wide boulevards and interesting restaurants, Brunswick’s downtown is attractive and well-preserved. However, as is the case with many smaller industrial towns, Brunswick is struggling economically. 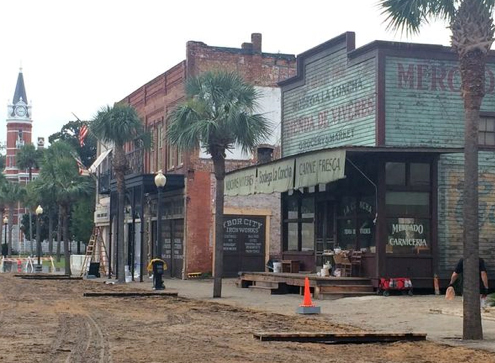 The City’s claim to fame is that Brunswick stew was created here on July 2, 1898. 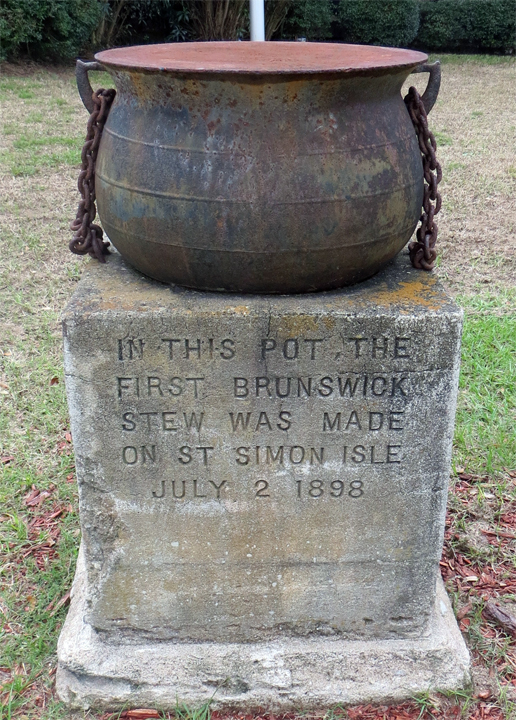 The actual stock pot used to prepare the stew has been memorialized in a city park. One block of the town’s main street corridor is closed to vehicular and pedestrian traffic. At first glance, there appears to be a major public works project underway. Upon closer inspection, construction workers are reconstructing storefront facades. Advertisements in Spanish appear on many of the buildings. 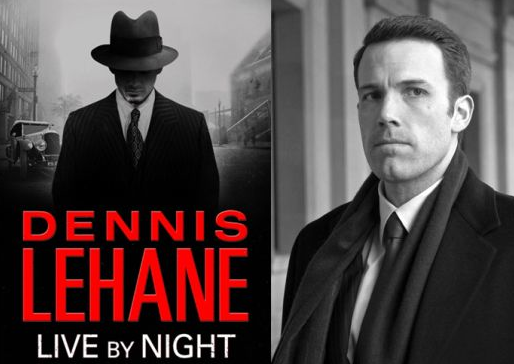 We learn that the entire city block is a scene that has been created for the movie Live by Night, starring and directed by actor Ben Affleck. 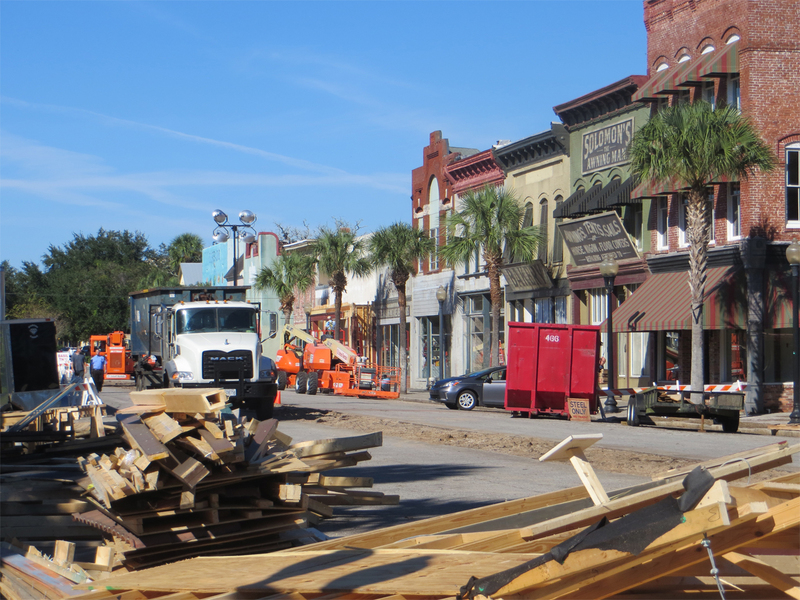 The movie is based on a novel by Dennis Cohane, set in Ybor City, Florida during the Prohibition Era. 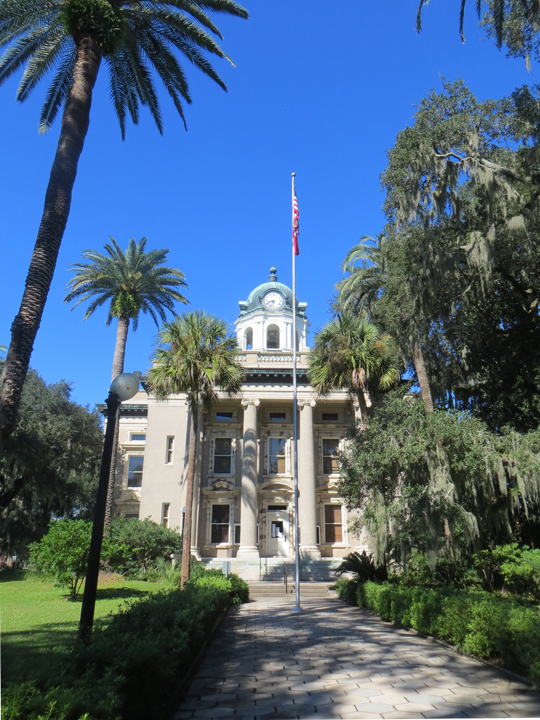 Ybor City was a Cuban enclave and cigar-rolling district where rum was bottled and shipped to speakeasies in New York City. Watch for the release of this movie in 2017. Our mission is accomplished in Brunswick. In the morning, Cutter Loose will depart on the ebb for Fernandina Beach, FL.